Augustus Woodward’s plan for the city of Detroit created some unusually shaped blocks. This one, bounded by Gratiot, Library and Farmer, is one of many unusual and non-rectangular blocks in Detroit’s downtown area. In the prosperous 1920s, when Detroit was the nation’s fastest growing large city, municipal revenues allowed for the building of several new libraries. This is one of the most attractive. It is a spectacular beautiful building with an important collection of historical documents. The Smith, Hinchman and Grylls firm faced a challenge capitalizing upon this unusual space. They also needed to make a choice about architectural style. Should this be a classical building resembling the library Cass Gilbert designed for the city’s Cultural Center, or should it reflect the then increasingly popular Art Deco movement? When you look at the library and let your imagination run, you will see both classical and Art Deco influences. This library houses the National Automobile History Collection. If you wish to conduct scholarly work on the history of vehicle firms in the United States, or if you wish to ascertain a specific fact about some make or model of vehicle, you may be a visitor to the collection housed in this attractive building. In the late Nineteenth Century, the Detroit Public Library began collecting information about the vehicle industry and then, over the years, expanded their materials. This includes many promotional brochures, advertisements published by the producers themselves, and four very large collections of photographs related to the auto industry. As Detroit was going through its economic travails in the late Twentieth Century, this lovely library was closed in 1998. There was even discussion of razing the building just about the time the nearby massive J. L. Hudson Department store was blown up. The Skillman family amassed their wealth through ownership of Minnesota Mining and Manufacturing—the industrial conglomerate that may be best known for Scotch Tape. The foundation, founded by Ruth and Robert Skillman in 1960 and with headquarters in one of the Renaissance Towers, decided to invest in this important and significant building.. In August, 2000, the Skillman Foundation appropriated five million dollars for the renovation of this library. Those funds were supplemented by monies from other sources and in 2003, the restored library opened its doors. Interestingly, the same architectural firm that completed the original building in 1932 was selected for the remodeling some seventy years later. Detroit has quite a number of impressive library buildings, including the Detroit Public Library in the Cultural Center that Cass Gilbert designed. 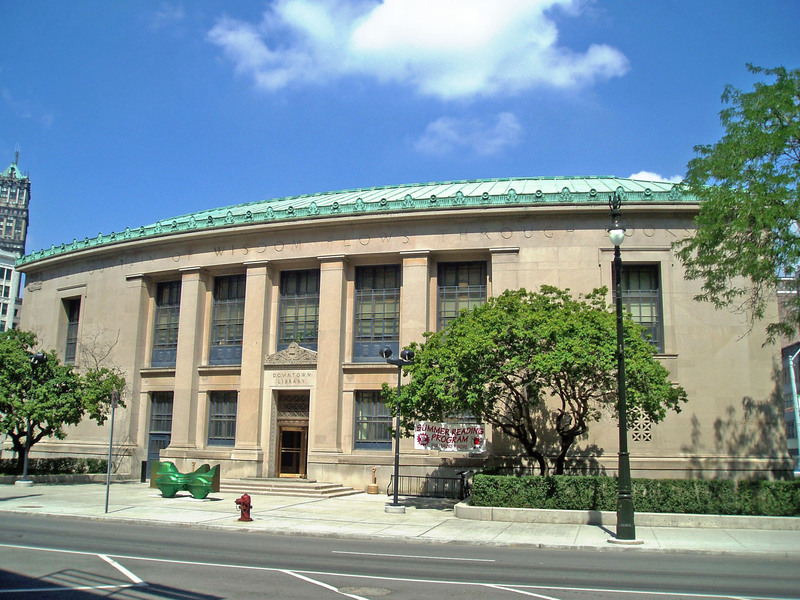 This Skillman Branch ranks among the most interesting and significant libraries in this country. In recent years, the Skillman Foundation has devoted much of its support to improving the quality of life for the residents of the city of Detroit. They appropriated one hundred million dollars in a ten-year Good Neighborhoods Program in which they seek to improve schools, improve health and help home owners in six Detroit neighborhoods: Brighton, Chadney/Condon, Cody/Rouge, Northend, Osborn and the Vernor neighborhood in southwest Detriot.